My mother has a fall birthday. In a few weeks to be exact and when thinking of what to send her, flowers come to mind. I always find the flower selection for this time of year so beautiful. The reds, oranges, yellows, darker pinks and purple hues compliment the season. Besides birthdays, fall flowers from Teleflora can be the perfect addition to any fall get together such as a Halloween party or Thanksgiving feast. They hand deliver fresh flowers for you to someone special, each arriving in a beautiful vase. 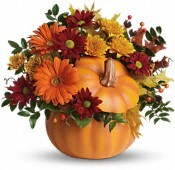 have an excellent selection of creative fall arrangements starting at $29.99. In addition to the richly hued flowers, the team at Teleflora have an amazing selection of accompanying vases including candy corn filled glass, tinted glass, cornucopias, baskets and wood boxes. These creative arrangements are sure to be a big hit and match the theme of your party or home. They make a great gift for a host or hostess, family or friend, or even a new neighbor. I have found myself buying flowers lately just to give a little more life to our home, now that the fall weather has settled in for a while. Stumped for ideas? Checkout some of their fall arrangement pins on Pinterest here. Be sure to follow them on Facebook and Twitter for daily deal announcements on their fall flowers!